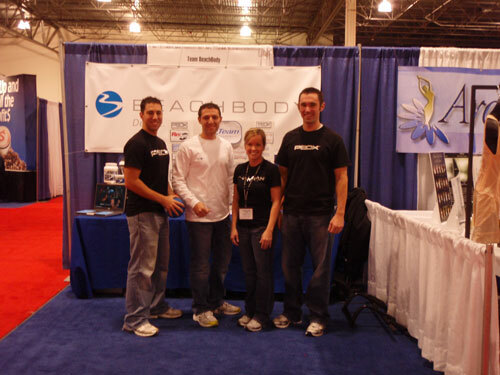 Last weekend I decided to see what it would be like to work a Business / Franchise Expo Event. I have been doing pretty well as a Beachbody Coach since I joined this past January. Over the past month or two its become more than just a way for me to stay in shape and promoting what I’m doing. People I don’t even know are sending me their P90X before and after photos saying how much they love P90X and that it changed their life. That’s powerful stuff. All I did was tell them what it did for me and offered some encouragement and tips here and there. I figured its time to get the message out even more than I am doing right now. I found out about a Business Franchise Expo at the Rock Financial Showplace in Novi, Michigan. It was scheduled for the following weekend so I did not have that much time to prepare. Let alone, I’ve never worked a booth before. I’ve only been the person walking around the expo. Since there is a business opportunity with being a coach I thought it would be a good fit. I invited some other coaches in my local area to attend it with me so they could get an opportunity to talk about what P90X has done for them. Nine people including myself worked the booth over two days. In the photo from left to right is Silvano, his brother Gianni, my girlfriend Andrea, and me. Gianni has lost 28 pounds doing P90X and is now doing Rev Abs. Silvano just started doing P90X and has lost 5 pounds. Andrea loves ChaLean Extreme. Even though she still has a week left, we took her measurements the other day and she has lost 10% body fat!! We all know there is no “Magic Pill” but people keep getting tricked by it. When I would glance over at another booth and see people drinking a sample of their product that promotes the answer to a healthy life I became a bit puzzled. The reason was because the person selling it didn’t look healthy at all and most were over weight. How is that a good representation of the product? Its not. My next favorite one was a slimming garment that promoted “losing 3 sizes in 30 seconds.” You put this thing on that felt like Kevlar and it sucked every thing in. I kept thinking, so what happens when you take it off. Don’t the 3 sizes come right back? I kept seeing a lot of over weight men and women who would look at my table and see what we are about and say “that’s too hard” and go right to the slimming garment and be happy as hell. If you have ever done P90X or any other Beachbody workout, you know that those 3 sizes will be gone forever with a little determination and effort. But as my buddy Joe says, 90 days is just too long. People want the results right now. Its sad, but true. We had the table with the answers but people walked by us looking for the quick fix. Joe even did the Insanity workout in the aisle way to show people how crazy it (and he) was. All in all it was a good experience. We met some people who knew about the products and we talked to them about the business part of it. It was not that good of a turn out unfortunately. The company putting on the event said 1800 people showed up last year and I think there might have been 500 over both days. We had a good time and it was great to see my friends talking to strangers about what P90X did for them. We now know what to do for the next expo we attend.